Bollywood is running divided right now amidst the harassment allegations that actress Tanushree Dutta has levelled against senior actor Nana Patekar. 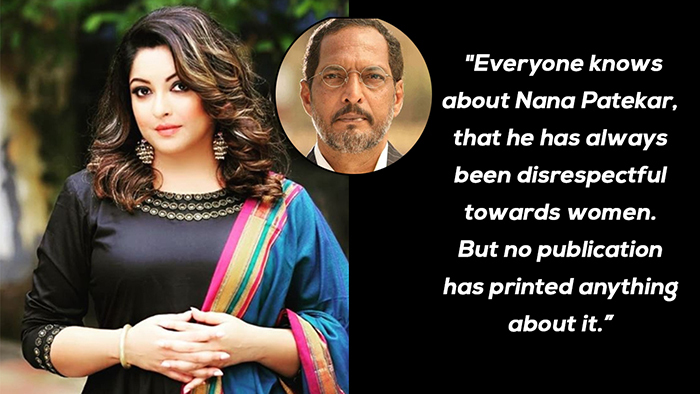 In an interview with Zoom TV, Tanushree Dutta alleged that in 2009, Nana Patekar had behaved indecently with her on the sets of his film ‘Horn Ok Pleassss’. Tanushree also named the film’s producer, director and choreographer Ganesh Acharya, saying that they took Nana’s side and wanted her to do an intimate dance step with him for an item number. Tanushree had filed an FIR soon after the incident. However, no one stepped forward to support her. Furthermore, the filmmaker called for a press conference where Nana Patekar denied the allegations and Tanushree was labelled as unprofessional. As for the item song, Rakhi Sawant was roped in to replace Tanushree, and Rakhi went on to trash Tanushree for acting too pricey. Ever since the interview has come out, the reactions have been divided. While soome wonder why this is the first they’re hearing of this and are defending Nana Patekar, others are applauding Tanushree Dutta for speaking up. Journalist Janice Sequeira penned a Twitter thread corroborating Tanushree’s account of what happened a decade ago, while Ganesh Acharya has denied it. Amitabh Bachchan, on the other hand, was slammed for avoiding comments on the whole issue. And now, finally, the man in question, Nana Patekar has spoken up about what he thinks of Tansushree’s claims. It remains to be seen what both Nana Patekar and Tanushree Dutta’s next action is going to be.